You are at:Home»Life»Community»Local News»We Put Beijing’s Dunkin Donuts to the Test: Which of Their 18 Varieties is the Best? We Put Beijing’s Dunkin Donuts to the Test: Which of Their 18 Varieties is the Best? With Dunkin Donuts on the brink of making its triumphant return to Beijing after an absence of 15 years, we here at the Beijinger have been waiting with anticipation. Originally scheduled to start welcoming customers just before Spring Festival, the first shops (in Changping, Shunyi, and Wangjing) are now slated to open either at the end of this month or some time in early March. Eighteen varieties of donuts will be sold when they finally do swing open those doors for real, but the question we just could not wait to have answered was: will the local donuts taste just like home for us DD fans? And perhaps more pertinent to the long-range prospects for the brand, will Chinese people go for it this time around? Using a few back-channel connections we discovered that Dunkins has been training its staff on the ins and outs of donut making here in Beijing for months, which meant a daily surplus of donuts with no sales outlet. The good folks over at the training kitchen were kind enough to give us one of their fresh batches to put to the test. We assembled a panel of six foreigners and six Chinese, to taste all 18 varieties and rank them from their least to their most favorite. Here we present our findings, counting down from the least to the most favorite of the 18. The donuts are listed according to the average ranking of all 12 members of the panel. To tease out foreign versus local tastes, we also list the rankings for the Chinese half of the panel and the foreign half. This banana cream-filled creation with a banana-flavored topping came in last, putting off tasters from both sides of the aisle. Points off for the brittle coating that easily fell off the delicate donut upon biting, and the banana flavoring that tasters found artificial. However, some of our tasters loved it, finding it cute and unique among the other flavors. This classic cream-filled, chocolate-coated donut did not fare well overall. Fans of the hometown version will find the dark chocolate coating not sweet enough and too waxy, while the filling lacked the vanilla taste of its American cousin. However, the tasters that did like this one appreciated the fact that both filling and topping were less sweet than US Boston crèmes. This strawberry-topped cake donut looks the part – it’s the classic Homer Simpson donut with sprinkles – but tasters found its strawberry flavor artificial and its coating too waxy, which meant pieces of the topping broke off with each bite. Fans praised its strong strawberry essence and cute appearance. This plain, unglazed chocolate cake donut failed to stand out to many of our panelists. Chinese tasters likened it to a mildly chocolate-flavored mantou, while fans of DD from the US found it not sweet enough for their liking. Fans praised its simplicity and the soft richness of the not-too-sweet chocolate cake base. Tasters praised the strong blueberry essence of this jam-filled donut, though Chinese tasters tended to think the filling was too sweet. DD fans found it to be a fairly accurate rendition of the US version, and some claimed to have tasted actual blueberry fruit in the filling. While fans called this one “perfect” and loved the strawberry filling, others claimed it was not as authentic a fruit taste as its blueberry cousin and the sweetness of the jam overwhelmed any strawberry taste. This lightly sweet, cream-filled donut was one of three donuts that strongly polarized the panel, with foreigners ranking it quite low and Chinese ranking it high. Foreigners found the filling lacked sweetness or a distinct flavor; Chinese praised it for the very same reason, enjoying the light, creamy filling and finding the overall package not overwhelmingly sweet. Half of the Chinese panelists ranked this donut among their four favorites. One of two savory donuts that make it on to the Beijing Dunkin Donuts menu, the Peanut Crunch was ranked high by Chinese panelists for its fresh peanut flavor. However, foreigners expected more of a sweet, peanut buttery taste and were surprised to find it on the salty side. Panelists both foreign and Chinese appreciated the coarse nature of the peanut pieces, which gave the donut a markedly different mouth feel than the rest. Another polarizing choice that defied Chinese/Foreign divides, with tasters on both sides either loving or hating this confection. Featuring a white chocolate frosting and chocolate sprinkles over a chocolate cake donut, the White Chocolate was ranked in the top four by one foreign and one Chinese taster, while others gave it generally lower standing. Those that did love it noted the unique white chocolate topping in a field of mostly dark chocolate coatings that provided a nice contrast with the chocolate cake base. This rendition of one of Dunkin Donuts’ originals stays true to its taste back home. Soft, moist, and delicately spiced without any overpowering fillings or toppings, it’s perfect for dunking in coffee, said our panelists. 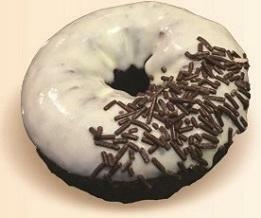 A slightly misnamed donut, as it’s not much more than a Chocolate Frosted with a decorative swizzle of white topping. The topping is markedly less sweet and somewhat more waxy and brittle than its American counterpart. Nevertheless, the Chinese side of the panel liked it enough to give this pastry a fourth overall ranking. This cake donut has a light dusting of sugar. Foreigners found the dough soft and airy but the sugar coating was not quite sweet enough and too grainy as a consequence of using fine granulated sugar rather than powdered sugar. Chinese reactions included that it was not too sweet, placing it it the third best donut overall. A heavy, dark chocolate flavor permeates this local version of the classic Chocolate Frosted, and rainbow sprinkles complete the deal. Rankings were dependent on if you enjoy a darker, more bitter chocolate flavor; self-professed dark chocolate fans loved this donut, whereas those used to the sweeter taste of its American doppelganger were less thrilled with this entry. The authentic flavor of this classic powdered donut propelled it to the number five slot on the overall rankings, with one foreign taster saying it was right out of his 1970s American childhood. A moist cake base here is complemented with a light coating of sweetened cinnamon powder. More interestingly, this was the only donut on the panel that foreigners loved and Chinese people hated, with foreigners ranking it as the third best of the bunch while Chinese rated it second-to-last. Savory dried pork is employed for this decidedly not sweet donut that panelists agree would never fly in Dunkin Donuts’ home country. However, the Chinese side liked this donut the best, praising the texture and balance of the donut with its unusual, slightly salty topping. The most polarizing donut of the entire field, with Chinese rating it Number 1 overall whereas foreigners rated it dead last. The foreign panel chose this one as the top donut overall. One of the most authentic of the entire field, it featuring a classic, sticky-sweet topping over an airy raised donut base. “I died and went to donut heaven,” said one foreign panelist. The Chinese side found it on the overly sweet side. True love knows no boundaries, and chocolate lovers both Chinese and foreign gave high rankings to this unique concoction with a three-pronged chocolate attack: a rich chocolate filling, a chocolate coating, and chocolate shavings on top. A less sweet dark chocolate tinge to all three prevents it from becoming too sweet to handle. The surprise overall winner had a universal appeal that remains unsurpassed, and is the only flavor to receive a top four ranking by both Chinese (2) and foreign (4) panelists. The contrast of the crunchy almond slivers, the rich, dark chocolate topping and the soft dough of the donut base shot this one to the top of the overall rankings. This post was first posted on thebeijinger.com on February 22, 2016.